Australia can be proud of her ultra running heritage and her very accomplished ultrarunners. AURA has been recognising these runners of the past by inducting them into the AURA Hall of Fame, a practice initiated in 2004. AURA has a policy for the AURA Hall of Fame. The policy can be viewed here: AURA Hall of Fame policy. The Flying Pieman emigrated from England in the 1840’s and was a pie vendor. His favourite trick was to sell pies to passengers departing from Circular Quay for Parramatta, a distance of 14 mile (22 km). The pieman would then run from the Quay to Parramatta, pushing his pie cart, where he would again offer pies to the same passengers. He was renowned for making wagers on the outcome of his feats of pedestrianism which included 309 km in 46½ hours and 2630 km in 39 days. Mike McNamara was a large-framed, raw-boned man who hailed from Queensland. He rose to prominence when he contested the Trans American (Bunion Derby) race in 1928 and then again in 1929. He went on to break the world record for 30 mile and 40 mile in Canada and was later involved in coaching in England. He was a contemporary of the great Arthur Newton and Hardy Ballinger from South Africa. Herb Hedeman also contested the Trans American races of 1928 and 1929. He was a renowned professional runner before then, competing in the Stawell Gift. He is the only person to have won both the mile and two mile events at the same Stawell Easter carnival, a feat which he managed on two occasions. The mile race at Stawell still bears his name. He then moved to America with stints at running in South Africa and England. Percy gained world renown for his coaching methods and was the coach of the uniquely successful and never-beaten Herb Elliott. Percy was legendary for his training techniques in having his athletes charge up and down sand-dunes while living a spartan existence at his Portsea training camp. What is not generally known is that Percy himself was quite an athlete and was one of the first persons to run from Melbourne to Sydney. George was a remarkable athlete from the 1960’s, ’70’s and ’80’s, holding many world and/or Australian records from 30 mile to 150 mile. He is best remembered for giving Tony Rafferty one week’s start and beating Tony from Fremantle on the west coast to Sydney on the east coast by one day. In his era, George was pretty much unbeatable at any and all ultra distances. Tony Rafferty – mid 1970’s to early 1990’s. Tony Rafferty was a very capable long distance runner whose exploits were well publicised, making him a household name. In the picture at right, he completes a Melbourne-Portsea-Melbourne run, overshadowing Percy Cerutty’s run from Portsea to Malbourne. He was the first person to run from Melbourne to Sydney and return. He was a one time holder of the world record for 1000 miles, a mark which stood for seven years. Ron Grant did many solo runs, between various cities. However, he really came into prominence when he became the first person to run around Australia in a ‘continuous’ run. By this self imposed requirement, ‘continuous’ meant no less than 20km each and every day. Ron completed the run of 13,383 km in 217 days for an average of 61 km/day. He also completed the first ever summer crossing on foot of the Simpson desert, generally considered to be Australia’s harshest. A female runner at a time when ultramarathon races were still virtually unknown was an oddity to say the least back in 1982. Lining up for the more difficult “up” run at the old Sydney to Wollongong 50 miler, Margaret stunned most of the men by finishing in 7:52:01. In April 1984 Margaret ran 100 mile in 16:01:43 thrusting herself into the elite handful of female ultra runners in the world. Then in a 100km race in late 1984 she finished 4th outright in 8:54:52. Cynthia took the ultra running world by storm in 1986 when she broke numerous Australian records. These included 50 mile in 6:52:42 and 9:15:26 for 100km. Later that year at the Adelaide Harriers Track, Cynthia charged through 12 hours with a distance of 115.25km, 100 miles in 18:11:37, then 200km with just minutes to spare in 23:56:10. She became the first woman in the Southern Hemisphere to break 200km in 24 hours. Cliff Young became a household name when he upstaged George Perdon and other more fancied candidates to win the inaugural Sydney-Melbourne race in 1983. Folklore has it that all runners retired to bed on the first night of the journey but Cliff awoke early at 12:25 am, misreading the clock for 5:00 am. Being out of bed and on his feet he decided to resume running. He managed to get such a start on the others that they were unable to catch him. Helen ran her first race, a 10km fun run, in 1988 and then her first ultra, the Sydney to Wollongong 50 miler in the same year, finishing in a remarkable 7:43. She achieved 200km in a 24 hour race in 1990 and later that year completed the Campbelltown 6 day race with a very creditable 691km. She went on to record 329.256 km in the 48 hour event in 1995 for an Australian record and then 229km in the Coburg 24 hour in 1998. Helen was never beaten by another woman in any 24 hour race. In a 16 year stellar ultra-running career, Bryan Smith established himself as the greatest Australian-born ultra runner of all time. His personal bests ranged from 8 hours and 5 minutes for 100km, 254km for 24hr and 1002kms for six days. He also ran in four Westfield Races finishing with two fourths, a second and a first in 1991, which many regard as his finest triumph. Bryan died suddenly on day 28 of the 2001 Trans Australia race and will be remembered as a true gentleman of the sport. 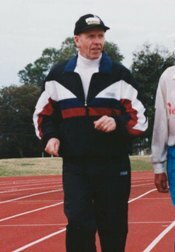 Born 24 December 1929 was a prolific mature age marathoner holding all year by year Australian age records from 57 to 75 years of age, all achieved at the Melbourne marathon. 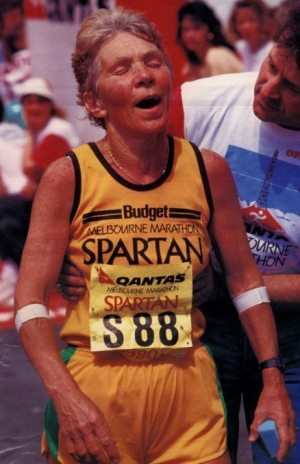 Shirley started running ultras in her early 60’s and has held some 18 Australian W60, W65 and W70 records at 6 hours, 12 hours & 24 hours and 50 kms, 50 miles, 100 kms and 100 miles. Many of her W65 and W70 records are also recognised as world records. Shirley died on 8 July 2016 at age 86. For more information on Shirley’s stellar running career and life, see this article from Kevin Cassidy. Believed by many in the ultra circle as the world’s greatest endurance athlete of his time, Kouros’ record breaking times have set the benchmark for ultra runners across the globe. He holds world records for 24 hours (303.506kms, Adelaide 1997), 48 hours (473.495kms, Surgeres 1996), 6 days (1036kms, Colac 2005), 1000kms (5d 16:17, Colac 2005) and 1000 miles (10d 10:30, New York 1998), while the 1983 Spartathlon 245kms saw him victorious in 21:53:42. Kouros ran Spartathlon three more times (1984, 1986 and 1990) winning each and every one, and today they remain the four fastest times in the 36-year history of the event. As well as setting world records, Kouros became a well-recognised hero amongst the general Australian population when he won the 875kms Sydney to Melbourne Ultramarathon no less than five times between 1985 and 1990. Born in Greece, Kouros moved to Australia in the 1980s and became an Australian citizen; he has since returned to live in the country of his birth. He was awarded AURA’s Male Ultra Runner of the Year in 2002.